The post continues my summary of the presentations at the CCBA Conference this past weekend. The prior post discussed the presentations from Tom Seeley, this post shares the two presentations from Vermont beekeeper Michael Palmer. I should state up front that Palmer gives these presentations around the world, and both are available on YouTube. While I knew of him as a beekeeper, I was not familiar with his theories and found the sessions quite enjoyable. Palmer started beekeeping in 1974 with two packages, both of which died over the winter. It was beekeeper error, he says, as he didn’t feed either of them and they starved. In 1982 he went to work for a commercial beekeeper with around 1000 production colonies. They pollinated an Apple Orchard that required about 600 hives: 3 days to get them in, 3 days to get them out. He eventually took over this business. In 1998 he visited his friend and local beekeeper Kirk Webster, and was surprised to see him overwintering nucs. It was April in Vermont at the time, and Webster’s nucs were bearded with bees. He was amazed, as at the time no one overwintered nucs. He resolved in 1999 to build a sustainable apiary without the need to constantly purchase new bees, and he has been working on this ever since. Recently he checked 108 of his hives, and found that just 8 had died over the winter. At this point I realized I had yet to touch the cup of hot tea I brought into the hall with me. I was so interested in Tom Seeley’s first talk and now Michael Palmer’s, that the tea had grown cold. The mark of a good conference, perhaps. According to Palmer, it all started in 1879 when A. I. Root offered $1 per pound of bees. Bees were so popular that in May 1980 they sold for $2 per pound, and the package bee industry was born. In 1974 Palmer paid $10.50 for each of two packages, and at the time honey sold for 50 cents a pound. So you needed to raised 21 pounds of honey to pay for that 1974 package. In 1975 prices had doubled to $19.95, and he shared numbers up through 2006 when packages were $54 each. In 2013 packages were around $100, and at $2 per pound you had to raise 50 pounds of honey just to pay for that package. Buying bees, Palmer says, is just not sustainable. Similar logic applies to nucs and other sources of bees. If you want to build a sustainable apiary, you have to raise your own bees. Eventually Palmer realized that overwintering nucs was a lost art, not something that Krik Webster invented. Webster wrote about the topic in the American Bee Journal at the time, but Dr. C. C. Miller wrote about the topic in the 1891 edition of The ABC & XYZ of Bee Culture. Palmer asked what beekeepers did with a bad hive? Many beekeepers requeen them, he says, which at best gives 1 colony. If instead you make 4 nucs, even if half of them die in the winter you have two colonies the next spring. Palmer does not advocate making nucs of your strong colonies, as you are only making your good colonies weaker. He prefers to use non-productive hives (not sick hives!) to make nucs. In a large apiary there is always one or two colonies not doing as well as the rest, so you break it up into nucs. Palmer’s technique is to move 2 brood comb, 2 honey comb, and 1 empty comb into a nuc box. He moves it to a new location and adds a nuc super to give the bees space to grow. He is not a fan of horizontal hives as he says bees like to move move up. In addition, horizontal hives require more space in the apiary as they are not as compact as a vertical hive. 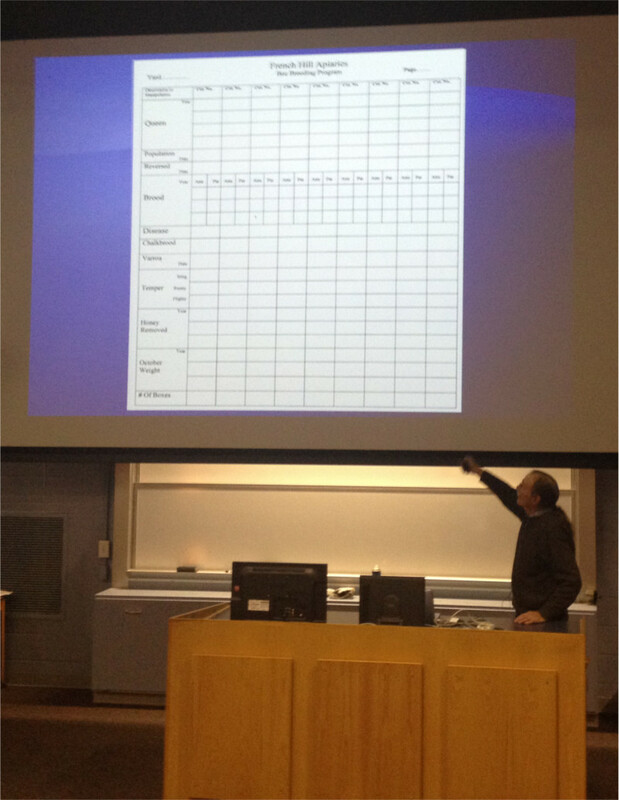 Michael Palmer sharing his evaluation form that he uses to monitor queen performance. Queen Evaluation: you can check for brood pattern, disease resistance, temperament, and other traits before dedicating the queen to a larger hive. Spring Queens: a ready source of new queens in the spring. Brood Harvest: you can readily harvest brood comb from a nuc to support your production colonies. Bee Bombs: if you merge a nuc into a another colony, you get a sudden explosion of bees for honey production or other purposes. In 2011, Palmer states he had 50 nucs. From these he generated 245 brood comb to stock cell builder hives for queen production, and between June 16 and July 20 created 330 new nucs. Palmer presented The Sustainable Apiary at the 2013 National Honey Show in England. Follow the link to view this on YouTube. This talk continued the earlier presentation by discussing how to raise queens in a self-sustaining apiary. Palmer believes you can raise great queens on your own, better queens that you can buy from distant queen breeders. Good queens, he says, come from lots of bees making lots of royal jelly. In his view better conditions trump better stock. That is, you raise better queens with the right environment rather than trying to find better bees. He had pictures of his big hairy queens, and the audience was suitably impressed. Palmer’s method is based on Brother Adam’s 10+10 cell building plan. He puts 7 brood frames and 2 honey frames on top of a strong colony, and when they hatch you have a hive with so many bees you can barely see the frames. When he removes the queen from the colony, the bees are primed to make excellent queens. I must admit that this was the most advanced talk of the day, and I had trouble following the details. Palmer was a mentor of local queen breeder Chris Hewitt, and I could tell that Chris had taken his approach from Palmer. For the full presentation, see the YouTube video on Queen Rearing in the Sustainable Apiary from the 2013 National Honey Show in England. In the end, Palmer reiterated the notion that you need a large apiary to make this process work. He suggested that small beekeepers could work together in a local association to follow his process. Alternately, he suggested supporting your local queen breeder, which is what I plan to do. Like the other posts on the conference, this post’s title comes from Proverbs 16, in this case Proverbs 16:26. Not an exact fit, but I know beekeeping is a lot of work, especially for a large operation. Thoughtful beekeepers like Michael Palmer are always looking for ways to improve their business. In Palmer’s case, the quest for sustainable beekeeping led him to develop and share his techniques. “He had pictures of his big hairy queens, and the audience was suitably impressed.” – Wish I could have seen those! I follow a variety of bee blogs from different countries and it’s noticeable to me that American bee bloggers are buying in a lot more packages each year. Winter losses tend to be less in the UK and I’ve never lost a hive over winter yet since I started in 2008 – this has meant I haven’t had to spend money on buying bees. A relief as a nucleus here costs £150-200. Did he explain any techniques for overwintering nucs, for instance using insulation or how he feeds? On overwintering nucs, some. He showed pictures of hives covered in snow (the hive heat appears to melt an air passage). He winters the nucs side by side to share the warmth, with one or two nuc supers, and wraps them in tar paper. He hinted that you have to work to keep nucs from swarming as well, so I am curious about more details on maintaining and overwintering. On the packages, totally agree. Lots of hobbyists here, and much less organization and hardly any club apiaries like you have across the Pond. Many people trying different methodologies somewhat on their own. Between huge variations in weather (very cold to very warm) mixed with double-dearths (summer and winter) in many places not the best recipe for survival. Good news is that we just had oxalic acid approved for use with bees, which the rest of the word has been using to good effect. So perhaps that will help some as time goes by. Right now there appears to more demand than packages available. Of course with the California almond fields needing some 1.5 million hives a year, it might get worse before it gets better. Good to know about keeping the nucs together and using tar paper. I have been reading about oxalic acid being approved for use in the US, am glad for you. Here we seem to be losing treatments – until a couple of years we had Fumadil B for nosema, but it is no longer approved for use in the UK. Though we did get MAQs last year. When making a nuc from an ‘unproductive’ hive whence comes the nuc queen? If you let the nuc bees raise their own it seems you might be propagating the genes for lack of productivity. So does this ony work if you also raise queens from productive hives? Thanks again for sharing these notes. A fine point. I assume Palmer assumes you’re raising your own queens. If you have a strong hive ready to swarm you might have a queen cell available. Of course, you can always support your local queen breeder. I’ll need to do some more research and reading on this before trying this out.